There's been a lot of speculation over the authenticity of Banksy's debut film, "Exit Through The Gift Shop." Is the film's main subject, videographer-turned-street artist Thierry Guetta (aka Mr. Brainwash) a real person or a Banksy creation? Was it actually Guetta who filmed the thousands of hours of street artist footage which composes the meat of the film? We cannot answer these questions, and that's fine. Regardless of the film's "realness," it remains both an astute comment on certain forms of contemporary art and a surprisingly hilarious character study. Banksy, his voice distorted and face hooded, with the help of Rhys Ifans' narration, introduces Guetta, a mustachioed Frenchman who owns a vintage clothing store in LA (watch for Beck checking himself out in a mirror) and who compulsively videotapes his entire life. Everything. All the time. "More than any drugs to anybody, it was obsession," he says. While visiting his family in France, Guetta discovers street art, thanks to his cousin "Space Invader," who caulks tiles on buildings and sidewalks throughout Paris. Guetta gets hooked. Now, he's set on filming street artists for the rest of his life. He works his way into the street scene, befriending artists known as Seizer, Swoon, Buffmonster, even famed "Obey"originator Shephard Fairey, and finally--his dream come true-Banksy, whom Guetta celebrity-worships with a fervor reminiscent of Rupert Pupkin in "The King of Comedy." Guetta becomes Banksy's accomplice, and after he endures four hours of interrogation at Disneyland because Banksy planted a mannequin dressed up as a Guantanamo detainee near a ride, he's officially in. "He was my guy after that," Banksy says. Now, armed with his own personal videographer, Banksy enlists Guetta to make a documentary about street art, ostensibly to prove that it's not all about the money.Guetta agrees, makes a horrible film, then Banksy confiscates the footage and sends Guetta back to LA, ordering him to put down the camera and focus on street art. Guetta dutifully obeys and, as is his obsessive wont, even refinances his house so he can purchase an old CBS studio where he can hold a massive show of his schlocky Warhol/Banksy knock-off pieces. Appropriately, Guetta's first attempt at street art-his warm-up attempt before the big show--takes the form of giant stencils of himself holding a video camera that he mass-produces and plasters all over LA. Notwithstanding his shift from "filmmaker" to "street artist," his approach to the creative process remains consistent: a compulsion for a diarrhea-like output of work. He's less concerned with what he's actually making than the fact that he's making a lot of it, and very quickly. His art is relentlessly banal--a full-blown version of the workaday process behind the art we see-with Shephard Fairey putting together his stencils at Kinko's and Banksy buying tickets to get into Disneyland. Churned out through a Warhol-esque factory of commissioned artists, Guetta's art exalts process, albeit inadvertently. Guetta's exploiting the talents of others to further his career and make a shitload of a money in the process. And isn't that exactly what Banksy's doing with "Exit Through the Gift Shop?" It is, and it's fun to watch. 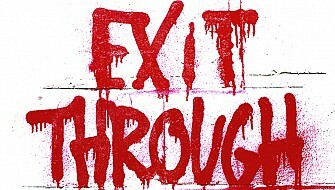 "Exit Through the Gift Shop" is playing in New York at Landmark Sunshine and Lincoln Plaza Cinemas.